At the northern end of the Sydney Harbour Bridge cycleway, cyclists have to negotiate 55 steps (an antiquated facility for the 21st century!) then ride through the North Sydney CBD, where they encounter some of the most hostile cycling conditions of any Australian city. Despite these barriers, around 2,000 cyclists are now riding across the Sydney Harbour Bridge daily. The recently released NSW BikePlan states (page 24) "The number of cyclists crossing Sydney Harbour Bridge on an average work day grew by over 60 per cent between 2006 and 2009." 700 to 800 cyclists an hour (around 10% of car crossings) cross the SHB during the morning peak-hour. HarbourLink would link the Sydney Harbour Bridge to the top of the Warringah Freeway at a superb grade of just 3%. The facility would provide a 1.6 km long mostly elevated multi-use pathway (for cyclists, pedestrians and wheelchair users) totally separated from traffic through to St Leonards Park and Falcon St. Further north, the shared user path / cycleway (SUP) is expected to proceed adjacent to the Cammeray Golf Course boundary, then past the bus layover (currently under construction) immediately east of Miller St, then underpassing this main road and also West St, finally overpassing the Brook St (city-bound) on-ramp to connect to the 7.5 km long Naremburn - Lane Cove - North Ryde SUP. Motorists know that the climb north of the Sydney Harbour Bridge to the top of the Warringah Freeway (6% grade) is considerable, so at half the grade HarbourLink would offer a remarkable facility for non-motorised users. North Sydney Council adopted this project in 2007. HarbourLink has already had front page coverage, including photo montage, in the Sydney Morning Herald on 17 December 2007. HarbourLink would offer superb vistas of the Opera House, Sydney Harbour and its Bridge and would become a major tourist attraction. Cyclists from all over Sydney's north are funnelled into the North Sydney CBD in order to access the only crossing of Sydney Harbour accessible by bike. On 'Ride to Work Day' in October 2007, close to 800 cyclists rode the Sydney Harbour Bridge cycleway in just one hour (7.15am – 8.15am), equivalent to nearly a whole lane of traffic (and almost as many were recorded on a damp day in 2008). This very significant usage occurred despite cyclists having to negotiate the dangers, congestion and pollution in the nearby North Sydney CBD. The latest Australian Bureau of Statistics census data shows that the major increase in cycling in NSW is occurring in the inner suburbs of the Sydney metropolitan area, including the Lower Northern Sydney statistical region. increased awareness of the impacts of Climate Change and the need for sustainable living. ever-increasing demand for oil and its effects on the economy. rising levels of obesity, even among children and its consequent impact on health costs and hence national budgets. The escalation in health costs well ahead of inflation is unsustainable*. the costs of increasing traffic congestion. Close to 180,000 motor vehicles use the Sydney Harbour Bridge and Tunnel every day, with usage exceeding capacity for an increasing number of hours every weekday. With the opening of the Lane Cove Tunnel in March 2008, even more pressure is being placed on these two cross-harbour facilities, compounding congestion. HarbourLink would take pressure off this crucial crossing. In Perth, where physical activity is strongly promoted, close to 6% of trips are by bicycle. For the Sydney Harbour Bridge this would amount to 11,000 daily bike trips, a very achievable figure following the construction of HarbourLink. Indeed, given the short distance between the two major CBD centres, higher percentages would be expected. $9 million in greenhouse gas-related costs. Another major cost to the NSW state government and its taxpayers is the School Student Transport Scheme, where the annual allocation was $427 million in 2003/2004, while the capital works for State Rail was $377 million. Yet the RTA recently reduced the bicycle budget to only around $5 million per annum. In its 2007-8 Bicycle Budget, North Sydney Council allocated $80,000 to improve the bike route between North Sydney and Willoughby. These funds were used to develop the HarbourLink vision through the production of a DVD with accompanying publicity posters. Most of these were sent under a letter from the Mayor of North Sydney's signature to key politicians and decision-makers. During the last year the Federal Government has allocated funding for cycling infreastructure projects resulting in close to $100 million worth of projects, this being a most welcome development. adjacent St.Leonards Park. Here cyclists have reached the lower North Shore plateau, offering generally well-graded terrain for many kilometres. the principal route (Regional Bicycle Route), which would overpass the freeway to its eastern side, then link to the Falcon St bridge about 400m distant, where a new underpass is under construction, proceeding to a future underpass of the Ernest St bridge just 250 metres to the north. From Ernest St, the principal route is just over a kilometre short of the recently completed 7.5 km long shared user path (SUP) facility that links Naremburn through Lane Cove to North Ryde, this being part of Lane Cove Tunnel Project. These facilities, known as Regional Bicycle Routes (RBR), include a proposed branch along the railway corridor to Chatswood station. These RBR’s form a vital network of bike routes that link into existing local bike routes. 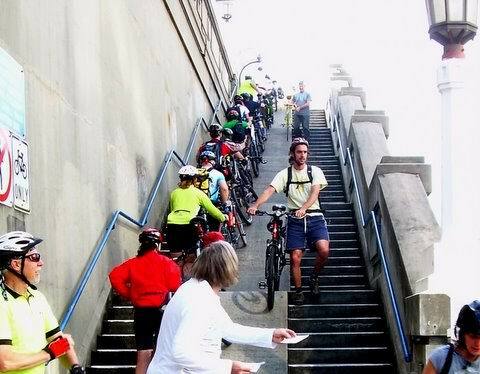 Anyone wishing to use the Sydney Harbour Bridge cycleway today has to negotiate 55 steps at the northern end. This not only discourages fit and able cyclists, it also makes cycling to and from the Sydney CBD almost impossible for older and very young cyclists. Tandems and riders towing trailers probably don't even make the attempt. Cyclists from all over Sydney's north are funnelled onto the Sydney Harbour Bridge Cycleway, the only bike-accessible crossing of the Harbour, yet riding through the North Sydney CBD, particularly northbound (uphill), is a very unpleasant and stressful experience for many cyclists. There are close to 20 motor vehicle lanes running north/south through or adjacent to the North Sydney CBD, but none provide for cyclists. While the North Sydney CBD has very high pedestrian activity on weekdays, the limited number of streets are very unfriendly for cycling, due to major traffic volumes, including many buses, associated pollution, congestion and steep hills. HarbourLink will address these concerns. With the community wanting sustainable, healthy solutions to the ever-increasing traffic congestion and pollution, HarbourLink would be a major impetus to safe cycling in a region where there is a very significant latent demand for this form of active transport. It would also offer the choice of an additional mode of transport as well as recreation along a superbly graded facility.